I was talking to a friend the other day about ultras. Ultra is short for ultra marathon, which includes running races longer than a marathon. The Ultra seems to be the new marathon. The ultimate physical challenge. The bucket list event. The thing to brag about at work. The longest advertised distance I’ve seen is 100 miles in a single day. Apparently 26.2 miles is now too easy. It’s not just crazy elite athletes doing them like it used to be. Regular crazy people do them too. To be fair, running long distance has been around probably as long as humans have been running. Japanese monks have a 1,000 day challenge. In the beginning, they run about 25 miles per day. For 300 days straight. And that’s the easy part. They do twice that later on. But we’ve seen a real explosion of running in recent years. A second running boom. With far more average joes taking up the sport. I love it. I love watching my friends set and reach really cool goals. I love to see them get happier through running. I wonder what ultras are doing to their bodies though. Is the human body meant to run that far in one day? People come into my store with injuries all the time. It’s fun trying to figure out what’s going on. I feel like a detective trying to put pieces together. Sometimes a different shoe helps a little. Sometimes a foam roller will make a dent. They generally don’t like going to the doctor, which is why they come see me. After consulting Dr. Google and Mr. Facebook of course. But I can relate to them. I’ve had just about every running injury possible. One time I ran a marathon with a stress fracture in my foot. Runners are determined, awesome, goal-setting people. Notice I did not say smart. Here’s my favorite Demotivator of all time. That’s me on the left. Some of my old friends have had to quit running. I look at my tri club and most are new members. Are all the veterans burned out? Or maybe just sick of dealing with injuries? It’s hard to say. At the store, I’ll never “fix” someone with a lot of different injuries. I can offer 10 tips on how to cope with running injuries though. I’m not saying they will work for you. But they have for me. And when you’ve run with pain for twelve years, maybe that means something. So here are my top 10 ways to cope with injuries. 1. Be thankful. Every day someone gets cancer or just drops dead from a blood clot. Lance Armstrong can’t even enter a triathlon. He’s banned for life. I get to run and all I have to worry about is a little pain. Plus, two testicles! Life is good. 2. Help others get into the sport. It’s really fun watching a friend as they get into running. They seem to be happier every time you see them. Even if they don’t lose any weight, they just look healthier. You just made a difference. The world is a better place because you existed. That’s the meaning of life if you ask me. 3. Live vicariously through their achievements. I remember when my buddy Spencer first came into me store. He was just this skinny little middle schooler who liked to do 5K’s with his mom. He eventually went on to win two state mile championships. Now he runs at an Ivy league college. I had nothing to do with his success but nevertheless I felt triumph every time he won. 4. Cross Train. Everyone says cross train when you’re injured. They say it will help you get back to running faster. Yeah, that’s true. I’m not saying you should do it for that reason though. Any exercise will make you happier. Just get some blood pumping and release some endorphins. Richard Branson says the number one reason he is successful is exercise. He can’t run his company if his body isn’t in prime condition. That’s pretty hefty advice coming from a billionaire. 5. Plan Your Comeback. I let myself get too busy. There’s just no time to really sit down and plan out my training. So I end up doing whatever I feel like on a given day. That’s not training, that’s exercising. Training involves following a plan. Use your down time to plan all the things you are going to do right next time. Maybe that means getting a personal trainer or a coach. Maybe it’s working on your technique. A brief note about being busy. A wise man once said that “lack of time is lack of priorities.” Think about that for a second. Is your day filled with urgent but unimportant tasks. Why not cut those things out and focus on the important stuff? The things you will be glad you did when you look back on my life in later years. “No” is a powerful word. I need to say it a lot more. Maybe you do too? 6. Surround Yourself With Positive Influences. Jim Rohn famously said that you are the average of the five people you spend the most time with. Spend a lot of time with workaholics and you’ll probably become one too. Think about who you need to cut out of your life so you can become the person you want to be. You don’t need to be mean about it. Just think of it like this. Your time on the Earth is pretty limited. Why spend it with people who bring you down? Avoid them. Some people ask me what to do about family who are downers. Same answer. If they make your life worse, they have to go. Do you really have to visit that Aunt and Uncle at Thanksgiving that hate you? Nope. Is it worth staying with a spouse “for the kids” if you each are miserable? You’ll both probably be far better parents if each of you are happy. How about finding positive influences? Start a mastermind group. Volunteer at a charity. Ask someone you admire if you can do some free work for them in exchange for mentorship. Ryan Holiday slept on his boss’ floor and worked for free before becoming director of marketing for American Apparel. He learned the book industry from Tim Ferriss and translated that into a New York Times Best Seller. He put himself near people he wanted to be like. 7. Learn. 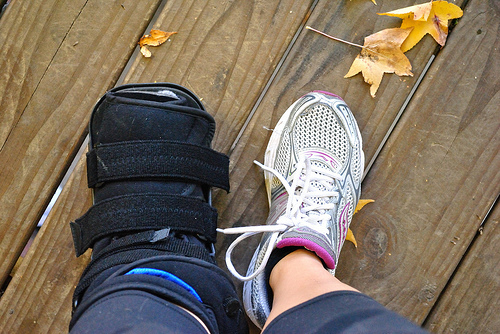 Check out some books about your running injury. Watch some videos online. The more you read, the better you will understand the injury. You might even figure out how it happened in your case. Maybe you can prevent it from coming back. 8. Meditate. I’ll be honest, I’ve only meditated maybe a dozen times. And I last around five minutes max. But you know what? I feel better every time. I use the Calm App on my phone. I heard about it from one of Tim Ferriss’ podcasts, which are super interesting. Listen to one on a run some time and tell me you didn’t learn at least one really cool thing. People who meditate a lot report that they handle their emotions better. They still get angry when someone cuts them off in traffic. But instead of being overcome with anger in every fiber of their being, they quickly rebalance…and notice the emotion of anger. Almost from a distance. They turn it around and say to themselves, “Huh. That’s anger. Interesting.” And then they let it go. I really would like to get better at this. About once or twice a year I get so mad I break something. I threw a microwave turner at a wall in college and it shattered everywhere. It was over an argument about dishes with my roommate. What a dumb thing to get mad about. The next week he stabbed a knife through my face in a photograph and stuck it to a watermelon. College! Best years of our lives! 9. Write. I was a late bloomer growing up. My first driver’s license shows I was 5’3″ and 105 pounds. High school is pretty much like Lord of the Flies. Kill or be killed. Couple the the constant threat of being beaten up or harassed with teenage hormones and you’ve got a pressure cooker. About this time Doogie Howser, MD was on TV. Cheesy 90’s TV at it’s finest. The episodes always ended with Doogie writing in his journal and learning a lesson. I never thought about journaling until I got a really big crush on my cousin at a wedding. I couldn’t tell my family. My parents weren’t exactly tight lipped about secrets. This particular secret was burning a hole in my soul. Every waking moment that weekend was spent planning what to do and say around her. I had this great idea of faking a trip and falling toward her. Which would of course lead to our lips coming together in an “accidental kiss” My first kiss. And then she’d realize I how amazing I was because I would be a naturally fantastic kisser. Regarding the accidental kiss plan, I should have known better. I actually tried it already – in 5th grade. I had a huge crush on this girl Amy. My plan was to push her a little too hard while playing tag and accidentally fall on top of her. Then…the kiss. Kid logic never works in the real world though. I pushed her way too hard. She went sliding into a huge mud puddle and ruined her white pants. I can still see her crying. Her mom came to pick her up that day because she was too wet and dirty to stay at school. Sorry Amy, wherever you are. Back to my cousin. Watching Doogie Howser helped me realize I could write things down in a journal. What a relief. But I didn’t want anyone to be able to read it so I created a letter code. I’d spend a half an hour writing a single sentence. Amazingly, I was suddenly relieved of all that pressure. Well, most of it. I was fourteen after all. I’ve journaled off and on since then. I am always in a better frame of mind when I’m doing it. It lets you get all that crap out of your head. To me, it’s like a reset switch. Blogging is kind of like journaling too. Only now instead of writing embarrassing things on paper to myself I write embarrassing things on the computer to everyone. 10. Write Ten Ideas Down Every Day – I like James Altucher’s books. He has the most interesting life story. He’s made tens of millions of dollars and lost it several times. I’m not sure I’d be friends with him if I knew him because he’s pretty weird, but I’ve learned so much from him! The awesome thing about books is that authors can serve as your mentors. You can read a book and learn all kinds of lessons the author had to learn the hard way. You can have hundreds of mentors. Just read lots of books. James has this daily habit where he writes ten ideas down about something every single day. The topic changes and he doesn’t even save the lists. It’s all about becoming an idea machine. No one’s ideas are all great. Most ideas are bad, but occasionally a really good pops up. This is always when he finds success. If you do this every day you will get really good at finding creative solutions to problems. It takes a while and you have to stick with it, but I think it works. Here’s a possible outcome: You get good at ideas and become more valuable at work. People ask you for advice. You meet other creative people from these new friends. Maybe you get offered a great job at another company. Better yet, maybe you see a niche that you can turn into a business. And then you work in your underwear at home while eating waffles. Success! If you’re injured, this idea generation might just open up some doors in your life. I’ve been writing ten ideas down most days for the past couple of months. It’s pretty fun and it just takes a few minutes each day. I had a couple really cool ideas that I’m excited to try at my store. Just remember, not all ideas are good. Like my new idea to advertise Bra Fittings below. That’s ok. I’ll keep trying. Derek was perfect to include in this post. He runs ultras and has absolutely no shame in taking ridiculous pictures. He’s also recently engaged. Congrats buddy! So happy for you. What do you do to cope with an injury? Feel free to share your experience. Maybe your idea will help someone else. The world is full of people whom just switched sports after being too injured to compete in their fav. I just tried several after being told the consequences of running again. Found two new ones that excite me. Variety of exercise is the key to staying fit. It helps your mind and prevents over use of the same body part. That makes a diff when you age. And you meet more people. Good article you wrote, or blog. Of course you do, Mom. Lol.